These homemade chocolate recipes will bring a smile to any chocolate lovers face. I have homemade chocolate cake, creamy chocolate sauce, rich chocolate glaze, chocolate chunk cookies and more below and at the end of the page. This homemade chocolate recipe is a keeper. So moist, rich and delicious. PREHEAT oven to 350 degrees. Grease and flour two 8 inch cake pans; set aside. Sift flour, measure, sift with baking soda three times. Cream butter thoroughly and add sugar gradually and beat for 5 minutes until light and fluffy. Add unbeaten egg; mix. Add melted chocolate and beat well. Add 1/4 cup flour and mix well. Add sour cream and mix. Add remaining flour alternately with milk, beating well after each addition. Add vanilla. Pour into prepared cake pans and bake for 35 minutes. To make the caramel filling, combine all ingredients except vanilla and cook until thick. Remove from heat and add vanilla. 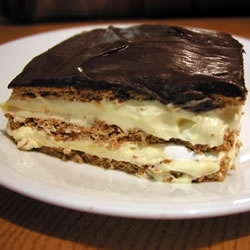 Cool and spread between layers of cake. 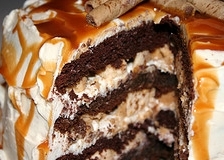 Spread the entire cake with my whipped cream icing and then drizzle the cake with caramel sauce. The next homemade chocolate recipe is to die for. Trust me. This is a sinful homemade chocolate recipe and is so easy to make. Try it today. Place a layer of whole graham cracker on the bottom of a 9x13 pan. In a bowl, combine the 3 cups of milk with the instant pudding and beat until smooth. Fold in the whipped cream and pour over the graham crackers. Next place another layer of graham crackers over the pudding mixture. In a small bowl, add the 2 TBS butter, 1/4 cup milk and Chocobake with the powdered sugar to make a soft frosting. Spread this mixture over the graham cracker layer. Cover and chill until ready to serve. This homemade chocolate recipe requires a lot of mixing; but so worth it in the end. Makes a beautiful holiday dessert. Melt the baking chocolate; cool and set aside. Cream the butter in a mixing bowl and SLOWLY add the sugar until light colored and well blended; light and fluffy. You should see the mixture turning white as it is beaten. If it doesn't turn white, you haven't whipped it enough. Separate two of the eggs and place 2 eggs whites in a bowl; set aside. Reserve the yolks. Add the eggs one at a time and beat with the whisk attachment for five minutes after each addition. IMPORTANT for this pie. As each egg is added, it will appear to thicken a bit. But after five minutes elapse it gets fluffy - and then gets even fluffier. Add the next egg and repeat for the 2 whole eggs and the 2 yolks. Place the egg whites in a mixing bowl and beat with the sugar until soft peaks form. Add the melted chocolate and mix well. Fold this chocolate meringue in with the filling and then place in the pie shell. Chill at least 4 hours before serving. 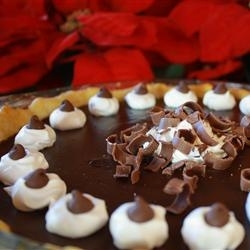 You may add a dollop of homemade whipped cream, Hersey kisses and chocolate shavings before serving. 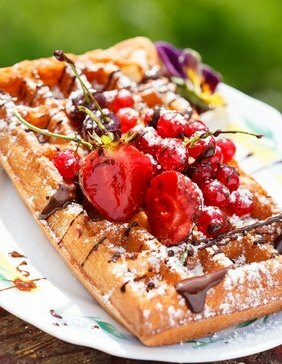 This homemade chocolate recipe is used often and a perfect garnish for Belgium waffles. Mix well and pour over the cake just before its completely cool so the glaze soaks in. You may make the glaze in the microwave using a Pyrex glass measuring cup, at 45 seconds for the chocolate chips, butter and corn syrup, stirring until smooth then adding the vanilla. Tip: spray the measuring spoon with non-stick spray before measuring the corn syrup and it will slide right out. Cut the chocolate into chunks. 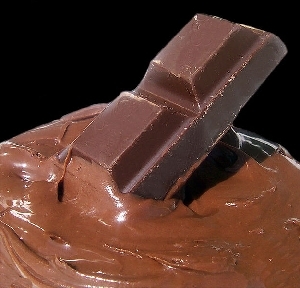 Melt the chocolate in a heatproof bowl set over simmering water in a saucepan. Stir occasionally, just until melted. Cut the butter into small pieces, and gently stir it in the warm melted chocolate in 2 to 3 batches. Add the Grand Marnier, and stir it into the chocolate mixture, added more to taste. It's ready to go. This is a wonderful homemade chocolate recipe. I use milk chocolate for this creamy and dreamy sauce. You can certainly use dark or semisweet chocolate. Please see another one of my chocolate sauces HERE. Makes a great ice cream sauce. Stir the sugar, salt and corn syrup together in a medium heavy bottomed saucepan. Pour in the milk and stir to blend. Put the pan over medium heat and bring to a boil; stirring frequently. Turn down the heat to medium-low and cook, still stirring, for 3 minutes. Remove from the heat, add the chocolate and stir until it is melted and the sauce is smooth. Stir in the butter and vanilla. Use immediately, or pour the sauce into a clean jar with a tight fitting lid; refrigerate until needed. 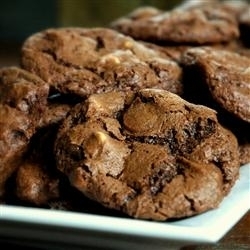 The best homemade chocolate recipe for cookies is below, but first some pointers before you make them. They are big, gooey, exceedingly chocolaty - thanks to the unsweetened, bittersweet and milk chocolate as well as the cocoa powder in the dough - and exceedingly chunky - thanks to the two different kinds of chopped chocolate pieces and nuts. You’ll never eat just one at a sitting. Your friends and family will beg you for this chocolate cookie recipe. Honest. A quick note on the chocolate: these cookies are very good made with store-bought chocolate chips, but they are stupendous made with hand-chopped excellent quality chocolate. Because I think the cookies are worth the time, effort and expense of using really good chocolate for both the dough and the mix-ins, I pull out my best bittersweet (or semisweet) chocolate and melt some for the dough. I then chop some into generous chunks to stir right in before baking. I also use hand-chopped good quality milk or white chocolate. Because some hand-chopped pieces will be big and small, and some will melt better than others, you’ll have a different chocolate treat with each bite. That's enough about this homemade chocolate recipe; let's bake up a batch. Sift together the flour, cocoa, salt and baking powder; set aside. Set a heat-proof bowl over a saucepan of simmering water. Add the butter, bittersweet chocolate, unsweetened chocolate and heat, just until melted - the chocolate and butter should be smooth and shiny but not so hot that the butter separates. Remove from the heat and set aside to cool. In a large mixing bowl, beat the eggs and sugar on medium-high for 2 minutes or until pale and foamy. Beat in the vanilla. Reduce to low speed and add the melted butter and chocolate, mixing only until incorporated. Scrape down the bowl and then on low,. add the dry ingredients. Mix just until the dry ingredients disappear into the dough, which will be thick, smooth and shiny. Fold in the semisweet and milk (or white) chocolate chunks and nuts. At this point you will have more "crunchies" than dough. The dough can be wrapped in plastic and kept refrigerated for up to 3 days. Drop the dough by generously heaping tablespoons onto the prepared baking sheets, leaving about 1 inch of space between the mounds of the dough. Bake for 10-12 minutes or until the tops of the cookies look a little dry but the interiors should still be soft. Slide off the baking sheet and using a metal spatula, lift the cookies onto a cooling rack to cool to room temperature. Repeat with remaining dough, baking only one sheet at a time and making sure to cool the baking sheets between batches. When the cookies are cooled and the chocolate is still gooey and you want it to be a bit firmer, just place them in the refrigerator for 10 minutes. A tremendous homemade chocolate recipe by Dorie Greenspan. Here's another homemade chocolate recipe that also substitutes as a homemade cake mix. You can store in the pantry for months. Sift flour, sugar, cocoa, baking powder, baking soda and salt together in a mixing bowl. Blend the shortening into the dry ingredients on medium, until there are no chunks. At this point in the recipe you can place the above mixture in a tightly secured container and store like a "cake mix." It keeps for several months. You just add the water, oil and eggs and bake. Blend the dry cake mix with the water, oil and eggs on low until just combined. Then beat on medium speed for two minutes and pour into the prepared cake pans. Bake for 30 minutes or until a toothpick inserted in the center comes out clean. When the cake cools, crumble it into a large mixing bowl with the frosting and mix. Cover and place in the refrigerator for 3 hours. On a cookie sheet lined with wax, roll the mixture into bite-sized balls and put into the freezer for one hour. Melt the chocolate. 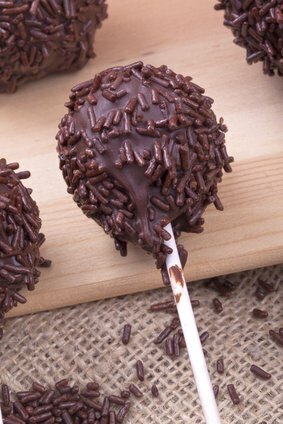 Dip the balls in chocolate using a toothpick or fork to hold them. Place on waxed paper to set. This homemade chocolate recipe makes a delicious icing. Be sure to click on the above links for more moist cake recipes. I do have more than just moist cake recipes, check out more of my favorites on the navigation bar to the left too.